In this blog post, I am talking about the best picturesque train ride in India. Probably, India is the only country in the world, where you can see all kinds of landscapes in the world and that too by traveling in trains. The ‘Indian Railways’ takes passengers, mails, and commercial goods from Kanyakumari, the Southern-most tip of India to the highest mountainous towns in the Himalayas, north of India. What are all the landscapes one can see while traveling in trains in India? Almost every part of India is covered by the Indian Railways, however remote it may be. Any Scenic Train Ride is forever romantic and the most enchanting mode of traveling in the world. Nothing can match the joy Scenic Train Ride gives us irrespective of the age group. All over the world, there are thousands of trainspotters like you and me. 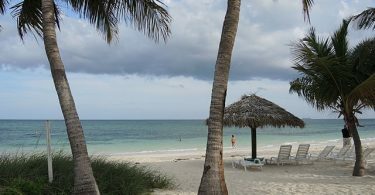 I am sure this blog post about the various scenic train rides in India will beckon the train enthusiasts. People like me who are born and grew up in India would always love train ride though there may be other preferences of transportation. 1. 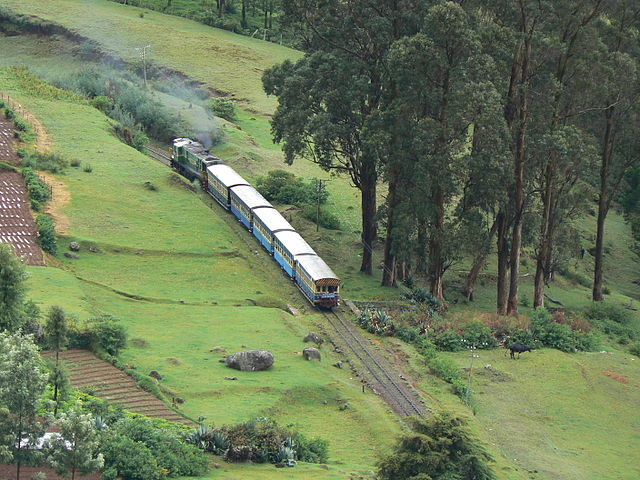 The Blue Mountain Express aka the Nilgiri Mountain Train Ride . I would rate this at the top of the list of panoramic train routes/ Scenic Train Ride in India because it is my first hill train ride. This narrow gauge train starts its 5-hour journey from the small railway station at Mettupalayam, located on the foothills of western ghat and about 45 kms from the industrial town Coimbatore, Tamilnadu State. The departure time is 7.10 AM from Mettupalayam. This toy train has been operating for more than 100 years. The Scenic Train Ride is miserably slow up the hill but the most enjoyable one. 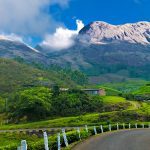 When it reaches the final destination Ooty, you will forget all your inconveniences and the slow train ride and would even regret to have reached your destination. 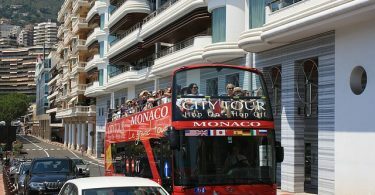 All through the way up, the breeze will slowly start getting cooler and you will see majestic and lush green mountains and numerous tunnels and mountain streams. Wild trees and plants, rows and rows of Eucalyptus trees, tea and potato planted slopes, myriad forest flowers and playing monkeys will give you company en route your Scenic Train Ride. Above all, you will never forget the sound of streams and exotic birds as you silently look through the train window. The train will stop at the following railway stations before terminating at Ooty at 7200 feet. 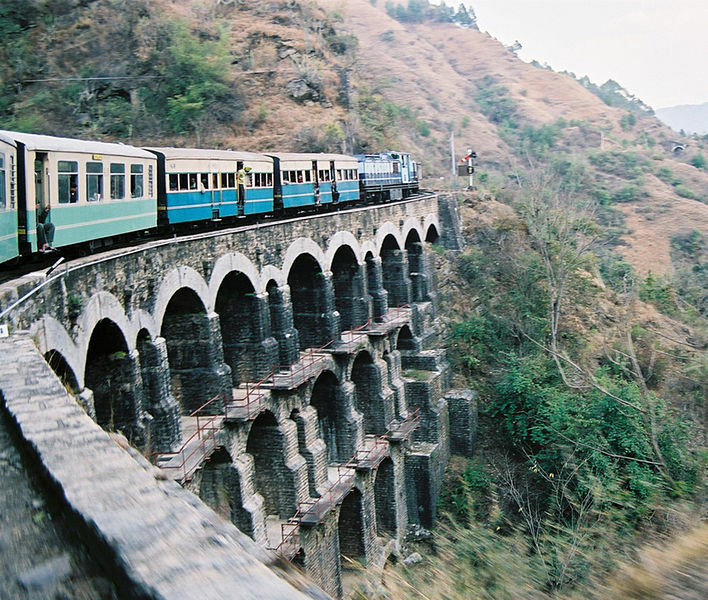 In July 2005, UNESCO added the Nilgiri Mountain Railway as an extension to the World Heritage Site of Darjeeling Himalayan Railway. 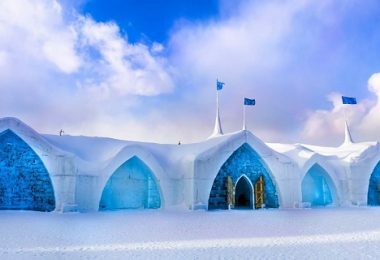 It can be the most thrilling Scenic Train Ride in India as the train passes through thick snow covered landscape and even the rail tracks are covered with white snow. Of course, this sight is possible from December to March only. The sight of small villages in the distance as the train cuts through pine forests would make your heart skip a beat. En route, you will go through an 11 km Banihal tunnel, said to be the longest tunnel in India. 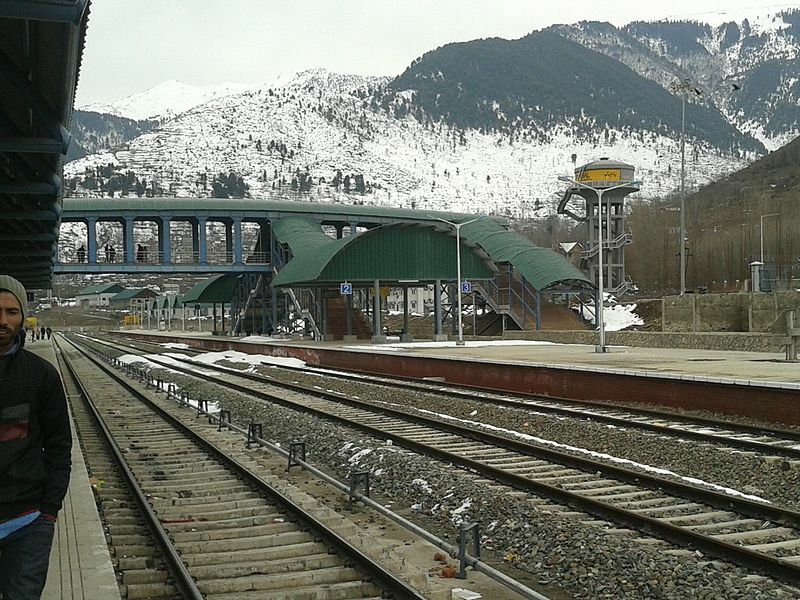 The Qazigund railway station is only 17 kms away from Banihal. 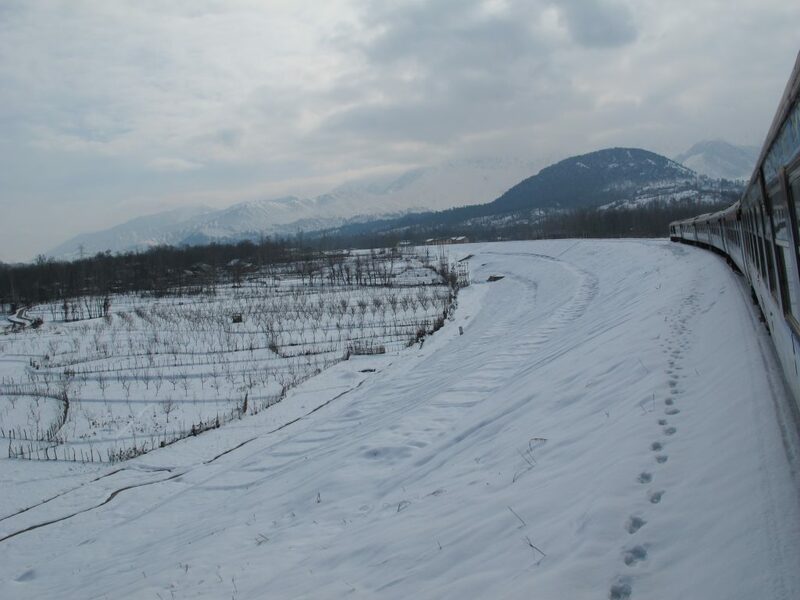 After passing through the Banihal tunnel, the train emerges at the outskirts of Qazigund and from there till Baramulla, the Scenic Train Ride will be absolute picturesque in the winter. There are about 4 to 5 trains from Banihal to Baramulla. You should take the one that runs during the day time. It’s a 2 hour and 50 minutes travel time to cover 135 km. The memorable scenic train ride is called ‘Snow Sojourn’ and aptly so. Here are the train departure times from Banihal. All these trains are ‘unreserved’ trains. Though this scenic train ride has been in existence even before 1970, it became hugely popular after it was featured in the famous Hindi movie Aradhana, released in 1970. After that, many scenic train rides in India beckoned worldwide tourists because of film produces who shot scenes in several trains in India. This particular hill train is the best and longest one starting from Kalka as per the time table given below and reach Shimla in about 5 hours to cover a distance of 94 km. As the toy train starts its steep crawling, some very beautiful landscape welcomes you. Forests filled with Oak and Eucalyptus trees, stunning looking valleys and brilliantly colored wild flowers would make you scream with delight. On the way, the scenic train ride will pass through 80 bridges and 100 tunnels. The video clip will reveal how the train ride is very picturesque. The traveling time from Bangalore to Mangalore is about 10 hrs. The train leaves Yeshwantpur terminal in Bangalore at 7.10 am and reaches Saklespur at 11.35 am. From that station, till it reaches Subramanya Road at 14.25 hrs, the scene outside the train is simply breathtaking. It’s a ghat section train ride that passes through 57 tunnels. 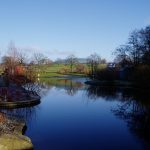 The hills are mist covered and several waterfalls would entice you to get down midway to touch the cool water. If you happen to travel during monsoon, the scenic train ride will be more enjoyable when you watch the full flow of Hemavathy river and the passing dense forests interspersed with coffee and cardamom estates and Arecanut trees. From the western ghats, we now shift to see the beauty of the eastern ghats that is filled with different flora and fauna. You won’t find the aromatic Eucalyptus trees on the much smaller hills on this side of India. The train number is 58501 VISAKHAPATNAM – KIRANDUL passenger starts from VIZAG at 6:10am and reaches the Arakku valley on 11:00am. The distance is only 115 km. 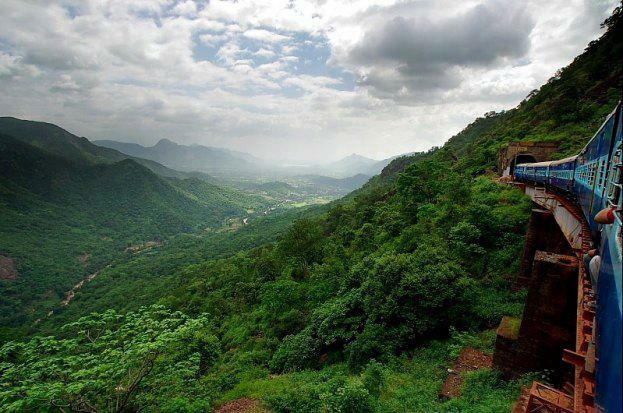 The picturesque train ride to the Arakku valley will be refreshing as you move away from the heat of Andhra Pradesh to the cool climate of the Eastern Ghats. There are 65 tunnels during the train ride. The two in between stops Shimliguda and Borra Caves are famous sightseeing spots. En route, you can see dense jungles and several mountain streams. The altitude of Arakku Valley is 1300 meters. The slow ascent up to the hill is filled with some waterfalls and beautiful orchards. The Scenic Train Ride from Lumding to Silchar in the state of Assam is said to be full of natural wonders that are too diverse to put into words. Let us first look at the train timings. Though there are two trains starting from Lumding, we will look at the one starting at and ending during the day time so that you can have a visual treat. The distance between Lumding and Silchar is 200 km and the travel time is 9.15 hrs, The train Guwahati Silchar passenger starts from Lumding at 5 am and reaches Silchar at 14.15 hrs. One can board the train at Guwahati also at 00 hrs. From Guwahati, there are 16 trains to Lumding. One can take anyone train to reach Lumding. 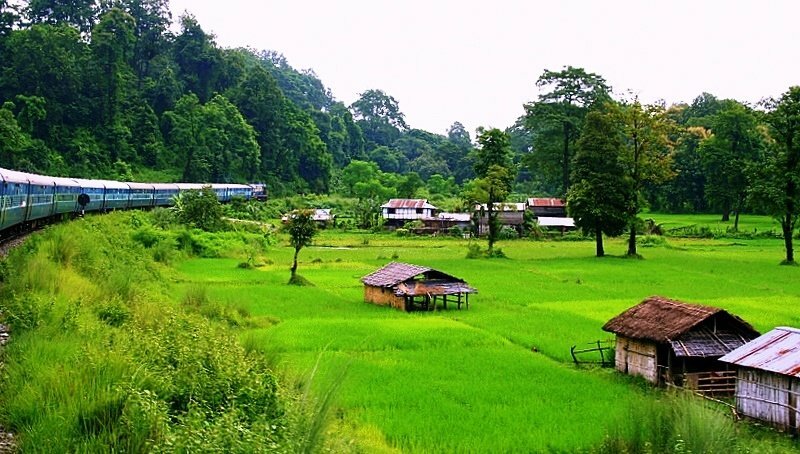 The Guwahati- Lumding- Silchar train ride is liked by staunch nature lovers and Scenic Train Ride buffs because the route goes through some dark jungles, sunny paddy fields, tea gardens, lush green Barak valleys and perennial rivers including River Jatinga. The Scenic Train Ride crosses several Himalayan rivers that are said to be perennial. Another beautiful train ride starts from Silchar at 8 am by Silchar Agartala passenger and it reaches Agartala at 17.15 hrs, covering a distance of 254 kms in 9 hrs and 15 minutes. There are several tunnels between Silchar and Agartala. The train ride from Lumding to Badrapur is on a hilly terrain that is always cool to pass by in a train than any other transportation. 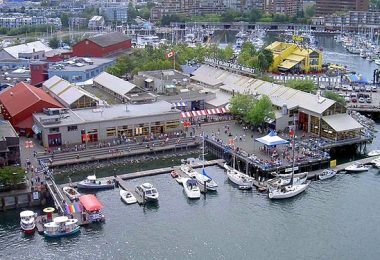 You should know that the track has been cited as a UNESCO Heritage site a few years back. Dooars Voyage starts from Siliguri which is part of the beautiful Darjeeling district and terminates at Alipurduar via New Mal Jn. 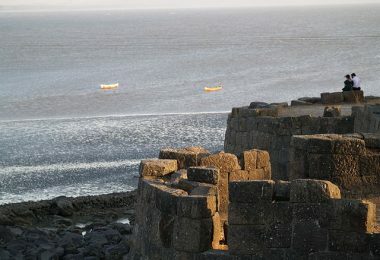 In Bengali, the doorway is known as ‘Dooars’. Since Siliguri is considered as the gateway to the enchanting North East India, the scenic train ride is thus named as Dooars. It is a journey of 3 to 4 hours only but what a sight during the entire 4 hours comprising of the wildlife sightings such as tigers and leopards, exiting mountain birds and rare butterflies. The video below will speak more than the words that follow. This is our last Scenic Train Ride in the Eastern Ghats before we again go to the Western India. Bhubaneshwar to Chilika Lake is 97 Km by train. 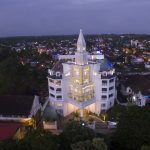 Though there are several trains running from Bubhavaneswar city to Chilka, the ideal train to take is the Intercity express from Bubhaneswar at 7.10 am and reach the Chilka railway station at about 9 am. The Chilka lake is a huge one and is a literal paradise for thousands of Indian and migratory birds. When you are traveling from Howrah to Madras, remember to go to the door to the left of train so that you can watch the beautiful lake very close. Watch out for a small railway station named Khallikote. After this station, the train takes a curve to its right and the Chilka lake looms into spectacular view. Look at the ever green mountains and the thick vegetation enveloping them. This picturesque train ride is always crowded with visitors because of its proximity to Mumbai and Pune, the tow big cities in Maharashtra. So, we are again at the green and cool western ghat section and this time, we take a train from Bombay to Pune via Lonavala. Before Lonavala itself, the train passes through another hill station called Khandala. 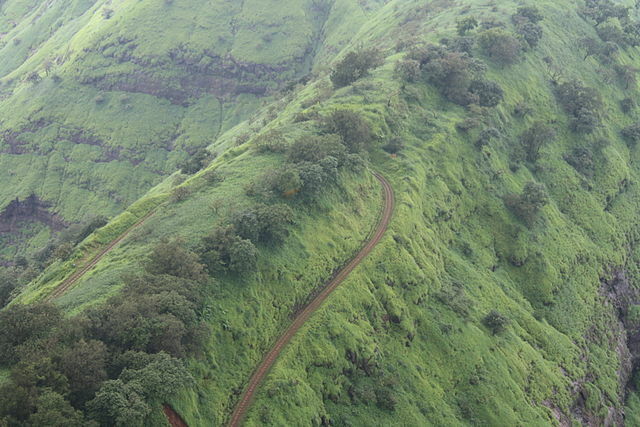 Lonavala is at an elevation of 625 meters. There are more than 25 trains in this scenic train route; it is ideal to take the intercity express at 6.45 am from Mumbai CST and reach the Lonavala at 8.50 am. 10. The Dudhsagar train ride from Goa to Mangalore. The Dudhsagar waterfalls is shown in many of the Indian films and is very famous in spite of its not-so-friendly location. Nevertheless, the sight of the thundering pure white water falls from great height (300 feet) will make your mouth agape. 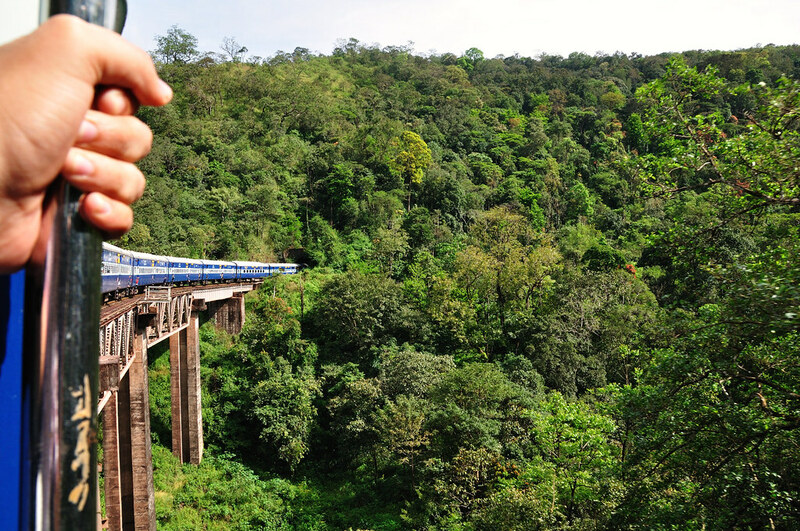 As the train nears its location, the scene unfolds to show breathtaking western ghats and the forests on the slopes of the mountains. The train journey between Pathankot and Jogindernagar is called Kangra Valley Odyssey. The total distance is 165 km but from Pathankot to Kangra is only 94 km. 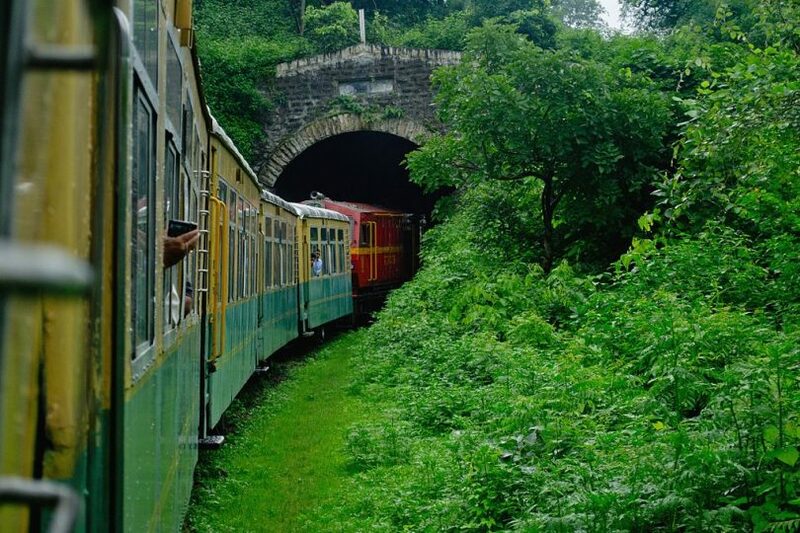 It’s a memorable Scenic Train Ride in the Kangra toy train. The picturesque Dharmasala is only 20 km bus ride from Kangra. The train ride gets steep from a station called Bajinath and the view presents the snow clad Dhauladhar hills. The valley itself is located at the foot of Shivalik Hills in the Himalays. The Pathankot Bajinath Kangra valley passenger train (Train number 52467) starts from Pathankot at 13.20 hrs and reaches the Kangra Mandir at 18.44 hrs. 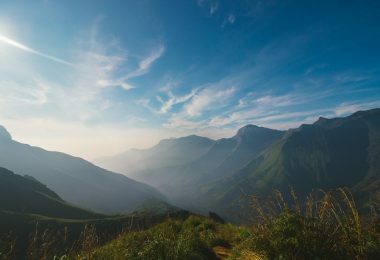 The Dhauladhar mountain range is very beautiful and similar to the Shimla hill station. The hills slopes are planted with tall pine trees and tea plantations. Hold your breath! In between the starting and ending stations, there are 970 bridges! This train ride is a shock after all the above green and cool rail routes of India. However, I reckon even the desert will look beautiful from the comforts of an air-conditioned train cabin-right? There won’t be any green cover all the way but the sight of lazy camels can be refreshing to some of the train enthusiasts. 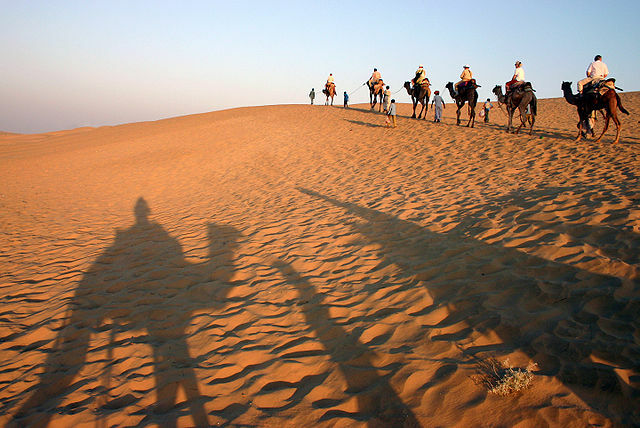 From Jodhpur to Jaisalmer, the train passes through vast expanse of sand dunes in the Thar Desert. Surely, the train ride will be challenging even the die-hard train buffs. Train number 14659, Delhi Jaisalmer express will leave from Jodhpur at 5.20 am and arrive at Jaisalmer 11.40 am, covering a distance of 300 km in six hours and 20 minutes. This engineering marvel –Pamban Sea Bridge connects the mainland of Rameswaram, Tamilnadu with the island of Pamban, Rameswaram. 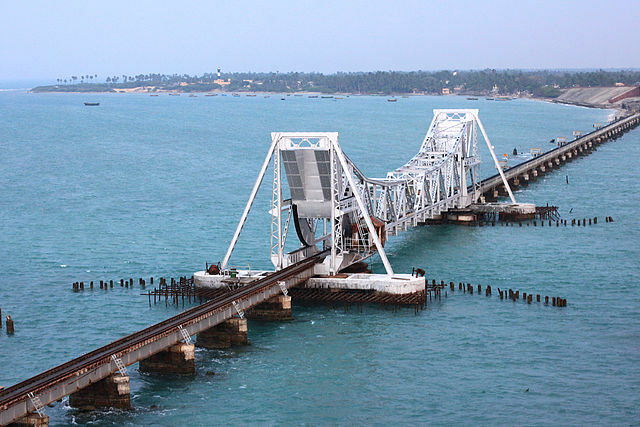 The train passes through the stunning looking Pamban Bridge built on the rough seas of the Bay of Bengal. The actual name of the water body is called Palk Strait. 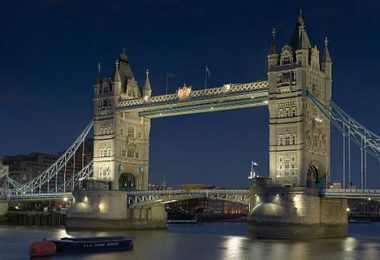 The length of the bridge on the sea is about 2 km. The train slowly goes over the bridge for 10 minutes before reaching the destination. The Pamban sea train has been running for the past 103 years! One can see the Cantilever bridge that splits into two upwards to let the ships and boat pass under. 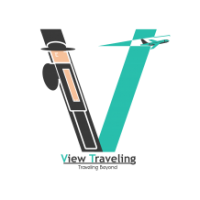 I hope this blog post about the wonderful and picturesque train rides in India would beckon the tourists and train spotters from all parts of the world. 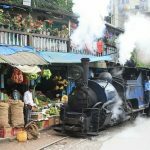 I hope this blog post about the wonderful and picturesque train rides in India would beckon the tourists and train spotters from all parts of the world. 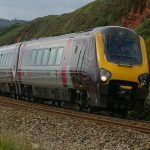 Excellent post indeed , would love to board on these beautiful train and yes it would a great adventure to travel by these trains.